Have We Already Been Seeing Inflation, Just Concentrated in Financial Assets Rather than Consumer Products? Is it possible that inflation exists but it shows up mainly in financial assets (stocks, bonds, perhaps real estate) that don't really factor into standard inflation metrics? Every step the Fed has taken, as well as other western central banks, appears to me to be crafted to pump money into securities markets rather than into main street. 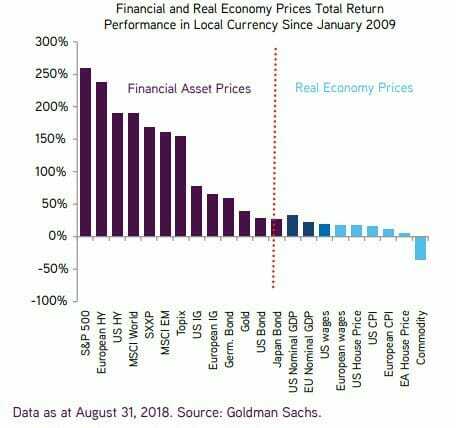 Certainly we have seen a huge inflation in the value of financial assets and real estate over the past several years. I will add that progressives want to use this data to make some sort of fairness / income inequality point about wages vs. rich people's asset holdings, but this chart is not a natural result of unbridled capitalism. It is the predictable result, even the desired result by its creators, of Fed policy in general and quantitative easing in particular. Category: Economics | Comments Off on Have We Already Been Seeing Inflation, Just Concentrated in Financial Assets Rather than Consumer Products? In a traditional C corporation, the corporation pays its own taxes, and then income that is passed on it its owners in the form of dividends is taxed again as personal income on an individual's 1040. The S-corporation was an positive innovation that has corporate income passing through to the tax return of the owners, and getting taxed only once on these individual returns. Over the last 50 years, there has been a steady shift of small businesses from C corps to S corps. But interpreting trends in the S-corporation component is extremely difficult. Feenberg and Poterba (1993), Gordon and Slemrod (2002), and Cooper et al. (2016) warn that much of the recent increase in S-corporation income is income that previously accrued to C-corporations. Such income is not “new” income earned by top earners but is simply income that was previously labeled as corporate income rather than household income. Yesterday at an event called One Day University, I saw a talk by William Burke-White of Penn and formerly of the Obama state department (I think he was one of many consultants, but I can never figure out seniority from people's biographies - his is here). Mr. Burke-White was discussing the liberal world order created by the US after WWII and recent decline / threats to this world order and American power. He discussed five trends or forces driving changes, and you probably can predicts many of them. He discussed the rise of new world powers (e.g. China), the rise of powerful NGO's (e.g. ISIS) and the expansion of the Internet (which can destabilize traditional powers). All fine, I have no particular comment on that stuff. He also discussed climate change, with a picture of Manhattan underwater, and though I am tempted, I won't even respond to that. What caught my attention was his fifth point -- about income inequality. He showed a slide with the meme that 8 people (Warren Buffet et al) had more wealth than something like half the world's population put together. His conclusion was that the liberal world order had failed because so much wealth had been concentrated in a few hands. Well, if American power and influence is declining in the world and Mr. Burke-White is an example of the thinking of the Obama administration over the last 8 years, I now have a better understanding of why. Sure there are really rich people. There were probably 8 really rich guys in 1400 (though they would have all been Kings and Emperors rather than private business people). The really different, world-changing event over the last 50 years has been the emergence from poverty of over a billion people, as facilitated by market capitalism. Never before in all of the history of the planet have so many people been pulled out of poverty in such a short time. Never before has such a large percentage of the globe moved beyond pure subsistence farming. If the leaders of this country find it impossible to communicate this simple good news, then of course the post-WWII liberal world order is going to struggle. Look, I understand that baby boomers (a group of which I am barely a member) have a hard time figuring out how to cope with this country's many past missteps. Yes, we have been ham-handed (and that is generous) in exercising our power and we have often failed to live up to our stated values. But helping to unleash a wave of market capitalism on the world is among our true successes. And this is the US's one true source of power, this wave of prosperity we have helped to birth. Other supposed sources of our power -- a big military and atomic bombs -- are horrifying. Market capitalism is our one source of strength that is genuinely positive. If we are staffing the state department with people who don't get this, then no wonder we are losing influence in the world. One of the dirty secrets about poverty measurement is that the actual measurement seldom has anything to do with absolute well-being. And this is the case with the OECD numbers. The OECD's poverty measurement is based on the country's median income, and is the percentage of people who are below a certain percentage (generally 50%) of the country's own median income. 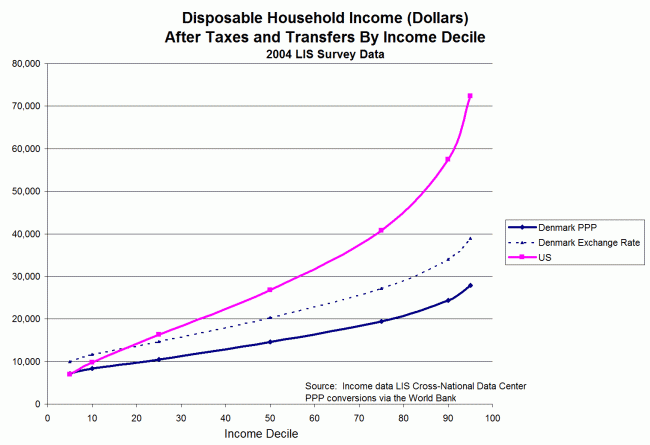 As such, this is more rightly thought of as a graph of income inequality rather than absolute poverty. Here is an example. Image country A with a median income of $50,000 and an income of the 20th percentile at $20,000. Now imagine country B where the median income is $30,000 and the 20th percentile income is $15,000. In this example, the poorest 20th percentile in country A are better off on an absolute basis, but the OECD (and most other poverty numbers) will show country B doing better because the poor are closer to the (much lower) median income. 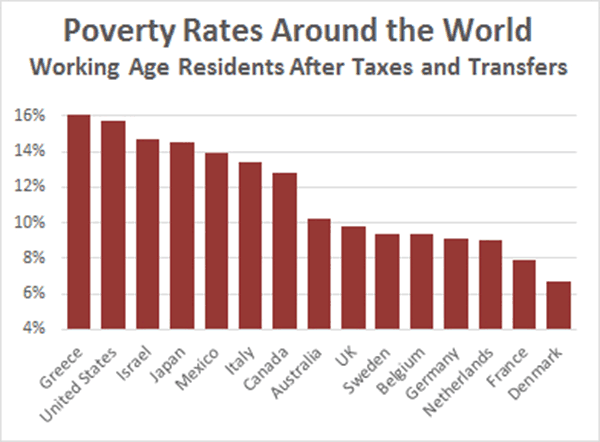 In an extreme example, if everyone in a country were equally impoverished, the OECD would show that country as doing the best on poverty -- Yes, you read that right. By this metric, the OECD would show a country where every person made just $10,000 a year as having 0% poverty. Obviously, what one would really like to do is compare across nations the absolute well-being of the lowest 10th or 20th percentile. 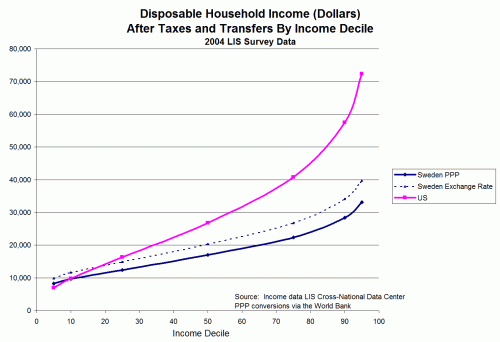 On a purchasing power parity basis, which country's poor has, after transfers and taxes, more money? Unfortunately, you likely have never ever seen this. Yes, the data comparison is hard, but it is possible, so one has to wonder if there is some ulterior political motive for never showing this quite obvious analysis. 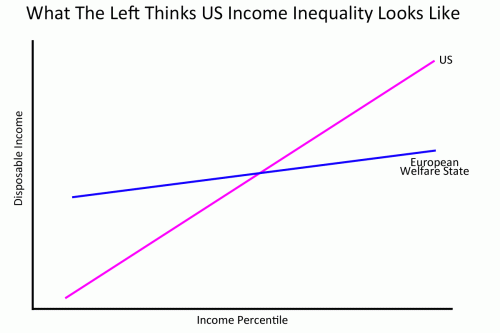 I tried to do this analysis myself for years (I describe some false starts here) but was unsuccessful until I actually identified a data source that would work, ironically from two folks on the Left (Kevin Drum and John Cassidy) who were using data from the LIS Cross-National Data Center to make comparisons of income inequality. It turned out the data they were using could do what I wanted. This chart shows, on a purchasing power parity basis, that for every single income percentile, all the way to the bottom, an equivalent person in the US has more income than that a similarly situated person in Denmark. In short, the poor in the US are wealthier than the poor in Denmark. The only reason Denmark does better than the US in the way the OECD and others measure poverty is that the middle class in the US are a LOT wealthier than the middle class in Denmark. I call it the Rorschach test because one either sees the US doing a good job, because everyone is better off, or the Danish doing a better job, because everyone is more even. Proponents of the latter view tend to believe that the size of the economic pie is an exogenous variable, unrelated to the method one chooses to slice it. I picked the Danish because they were the obvious comparison from Drum's chart, but here is the US vs. all the European countries for which there was data in the survey. The US is better than all but 3 at the 10th percentile and better than all but one country at the 20th percentile. And better -- by a huge margin-- for the middle class than any of the countries in Europe. Update: One more note on Drum's chart. As I said above, the exact definition of the OECD numbers is percentage of people with income less than 50% of the country's own median income. 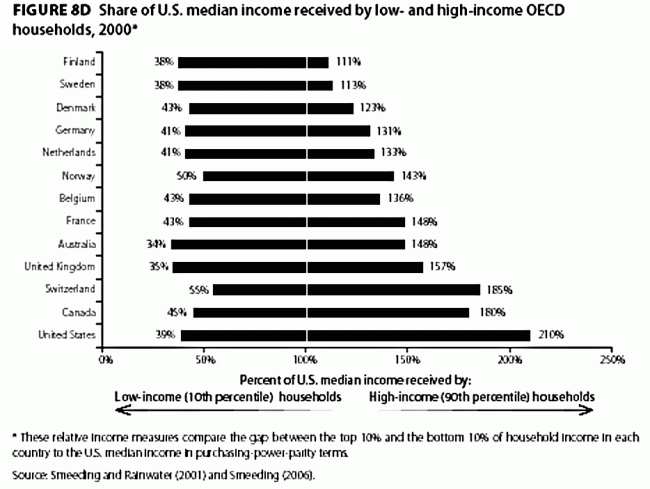 The US has a median household income, per the OECD, 41% higher than Denmark's. So the US has 9% more people under a number that is 41% higher. That is hardly a fair or meaningful comparison. For reasons that are beyond my understanding, I am banned at Mother Jones so I cannot post the comments directly to his article. If someone wanted to cut and paste this under his or her own name, I wouldn't complain. The Left spends a lot of time railing against the rich and large corporations. But in practice, they seem hell-bent on lining the pockets of exactly these groups. Today the ECB announces a one trillion plus euro government buyback of public and private securities. Between Japan, the US, and now Europe, the world's central banks are printing money like crazy to inflate securities values around the world -- debt securities directly by buying them but indirectly a lot of the money spills over into stocks as well. This has been a huge windfall for people whose income mostly comes from capital gains (i.e. rich people) and institutions that have access to bond and equity markets (i.e. large corporations). You can see the effects in the skyrocketing income inequality numbers over the last 6 years. On the other end, as a small business person, you sure can't see any difference in my access or cost of capital. It is still just as impossible to get a cash flow loan as it always was. Most folks who lament income inequality have the following model in their head: Wealth comes at a fixed rate from a fountain in the desert, and the rich are the piggy ones who hog all the output of the fountain and won't let anyone else in close to drink. The more anyone takes from the fountain, the less that is available for everyone else. And this was probably a pretty good model for considering pre-capitalist societies. The actual robber barons, before the term was abused to describe successful industrialists of the 19th century, were petty nobles (ie the government of the time) who did absolutely nothing useful except prey on those around them and on those who passed by conducting rudimentary commerce, taking from them by force. That is not how most people become wealthy today, with the exception of a few beneficiaries of cronyism (e.g. Terry McAuliffe). Postscript: A while back I was reading the Devil's Candy (terrific book) and thinking about movie-making. Perhaps it is not surprising that wealthy movie stars think in zero-sum terms. I suppose much of their success can be thought of as zero-sum. If I get the part, someone else does not. If I get an extra point of the gross, that is less for everyone else. If this movie does well, that probably means less revenue for another movie that came out the same weekend. Particularly for actors trying to make it or on the rise, movies have a fixed sum of value and they are trying to grab a larger share of that value. It is interesting that in their own sphere of influence, I never hear about such folks seeking any sort of income redistribution. Perhaps I have missed it, but I never hear Matt Damon say "hey, take one of my gross points and split it up among all the craft folks on the movie, or share it out with the 20 guys who didn't land my part." Do we really care about income inequality, or do we care about absolute well-being of our citizens? Because as I will show today, these are not necessarily the same thing. What has always frustrated me about income inequality arguments is that no one ever seems to compare the actual income numbers of the poor between countries. Sure, the US is more unequal, and I suppose from this we are supposed to infer that the poor in the US are worse off than in “more equal” countries, but is this so? Why do we almost never see a comparison across countries of absolute well-being? I have never been able to find a good data source to do this analysis, though I must admit I probably did not look that hard. But then Kevin Drum (in a post titled “America is the stingiest rich country in the world”) and John Cassidy in the New Yorker pointed me to something called the LIS database, which has cross-country income and demographic data. I can't vouch for the data quality, but it has the income distribution data and it struck me as appropriate to respond to Drum and Cassidy with their own data. In short, Cassidy made the point that the Gini coefficient (a statistical measure of income inequality) was higher in the US than for most other wealthy western countries. Drum made the further point that the US is "stingy" because we do the least to coercively alter this pattern through forced redistribution. I argue that the purchasing power parity(ppp) numbers are the right way to look at this since we are comparing well-being, and on this basis Sweden may be more equal, but more than 90% of the people in the US are better off. Sweden does not have a lower Gini because their poor are better off (in fact, if you consider the bottom quartile, the poor are better off in the US). We are going to see months of obsession by the Left and Obama over income inequality -- but which country would you rather live in, even if you were poor? Read the whole thing, there are lots of other interesting charts. I am working on some posts on income inequality, especially as compared between nations. One thing I have been thinking about is whether the US GINI (a measure of income inequality) is overstated because the US has a tiered retail system that gives lower income people access to lower prices (though for sometimes lower quality goods). We have Wal-Mart and Family Dollar, discount retail concepts that are rare, and often illegal (due to limitations on retail discounting) in European countries. On a sort of purchasing power parity basis, I wonder if this has any impact in narrowing the US effective GINI. Of course, this mitigating factor is somewhat mitigated itself by the fact that a number of urban areas with some of the poorest families (e.g. Washington DC) restrict entry of these low-cost retail establishments. Go where the jobs are. Duh. Pay particular attention to where there are jobs that match your skills, but in general a rising tide will lift all boats (e.g. you don't just have to be an oil field worker to find opportunity in North Dakota, they are paying a fortune for waitresses and retail clerks to handle the new demand). Look at pay for your skills vs. cost of living. Manhattan may pay the most for waitresses but living costs there are insane. You can get good work in Vail, Colorado over the winter but good luck finding a low cost place to live anywhere nearby. Unemployment rate. So far so good. Go where the jobs are. State unemployment payment rates. Seriously, their criteria is not cost of living or average payments for new workers, but how much one can extract from the government for NOT working? But OK, this still makes some sense (though there are a lot of barriers to crossing state lines for a better unemployment deal). Income inequality. WTF? What in heavens name does this have to do with unemployed people and how easily they can improve themselves. Is this psychological -- ie you will feel worse about being unemployed if there are a lot of rich people around? The average unemployed American is a service worker (if you are a skilled manufacturing worker, say a machine operator, and can't find work, you are in a minority). Rich people drive demand for service workers. I have been reading a lot of the data flying around of late about income inequality and mobility. And it struck me that income mobility may be a large part of what is driving many OWS protesters. Despite assumptions to the contrary on the Left, wealth is not a zero-sum game. Steven Jobs got richer by making me better off. But the one thing that is zero-sum is presence in the top 1%. When someone joins the club, someone, by operation of basic math, drops out. That does not mean that the other person who drops out is poorer, it just means that they are no longer as rich relative to their peers. This same effect works int he top 10% and 20%, etc. Looking at OWS protectors, they seem to be disproportionately children of the upper middle class or even of the rich. They have expensive college educations, live in nice homes, and have gobs of stuff (OWS must be the most iPhoned event in history). My guess is that they are of the upper two quintiles, or at least their parents were. I am wondering if the problem is not income inequality but too much income mobility. After all, a third of the top two quartiles in 2001 had dropped into the bottom three in 2007 (while an equal number moved up). Are these the angry proletariat, or are they children of the well-off who are upset their college degree in puppetteering did not automatically keep them up with the Joneses? Are they, in other words, Philip Rearden? This chart, from a book by Branko Milanovic via Carpe Diem reinforces a point about income distribution I make all the time - for all we talk about income distribution in this country, our poorest 20% would be middle class in many countries of the world. While I would love to see our poor doing even better, it begs the question of whether distribution or absolute prosperity is more important. Just to give you a feel for reading the chart, the US's lowest ventile, or bottom 5%, have income that would put them in the 68th percentile worldwide. 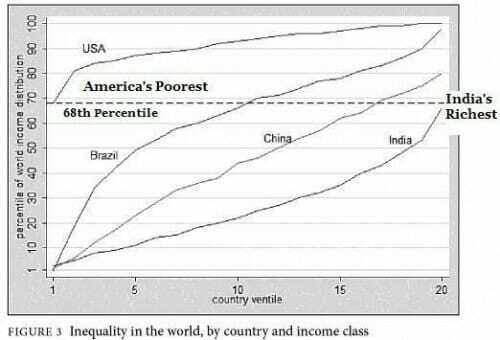 Our poorest 20% (the first 4 ventiles) would be upper middle class or better in Brazil, China, and India. When comparing to European social democracies, it turns out that while the US's income distribution is wider, that is almost entirely due to the top end being higher. The poorest 10% make about the same as the poorest 10% in Europe, and I would argue that this analysis (from a leftish think tank) actually underestimates a quality of life advantage for American poor, who come out higher even than the middle class in Europe on things like living space and appliance ownership. Perhaps more importantly than income inequality, income mobility remains high in this country. More on income inequality concerns here. Why Are Democrats Promising to Raise Prices? My new column is up at Forbes, and is on the Democratic push to raise the prices of Chinese goods (either through currency policy or tariffs). This has to be one of the craziest campaign themes of all time -- please, let us raise your prices. We should be thrilled that the Chinese government and its people see fit to spend their own money to subsidize lower prices for American businesses and consumers. Last week, President Obama put substantial pressure on the Chinese prime minister to revalue Chinese currency, a revaluation that would have the effect of raising prices of all Chinese goods in the United States. What possible sense does such a move make, particularly in a recession? Christian Broda and John Romalis, a pair of University of Chicago economists, have been doing work on income distribution. A couple of years ago they published a paper that showed how our measures of income inequality may be exaggerated because the metrics assume that both rich and poor experience the same rate of inflation. In fact, the researches found, over the last decade or so the poor have seen much lower rates of inflation than the rich, in large part due to goods of the type imported by China and sold at Wal-Mart (another institution Democrats like to demagogue against). Sadly, prices for low-income Americans could be even lower were it not for past protectionist measures. When one looks at the goods that have the highest import tariffs, one sees the very same goods that typically make up a disproportionate share of the poor's purchases: Tobacco, clothing, tires, auto parts, fruits and vegetables. All of these have their prices raised 20-350 percent by import tariffs. This means that at the same time Democrats have again raised issues of rising income inequality, they are trying to stop some of the most powerful forces at work mitigating these income differences. There is no question that if Democrats are successful in changing China's currency policy and/or imposing new tariffs (taxes) on Chinese goods, prices will rise for all Americans, but particularly so for the lower income brackets that are supposedly the Democrats' constituency. The most frustrating part of this whole effort is that it is aimed at a myth: the declining American manufacturing base. In fact, American manufacturing output continues to hit new all-time highs "” despite the current recession, American manufacturing output today is still 40% higher than it was in 1990. First, I have not doubt that income inequality-- in whatever way the folks who care about such things measure it -- has increased. The analysis that has been making the rounds of liberal blogs show the rich "capturing a higher share" of total output. The very terminology here reveals their faulty core assumption, treating wealth as a zero-sum that must be grabbed and fought for and can only be gained to someone else's disadvantage. They always write about incomes as if GDP is a sort of natural fountain in the desert, and the piggy rich crowd in too close to get more than their fair share of water from the fountain. This is silly. Wealth is created from the minds of human beings, and there are human minds that create far more wealth than others, and are able to keep some of that wealth for themselves as a reward. I say "some" because even the richest people tend to keep only a small percentage of the wealth they create. Sum up the benefits we all get from our iPods and iPhones and iPads, and the total number dwarfs what Apple shareholders have made from these devices. "A large literature has focused on the rising inequality observed in official statistics, but have mostly abstracted from the fact that these official measures are based on a single price index for a representative consumer. This assumption is not crucial in a world with a stationary relative price distribution or where an identical basket of goods is consumed by different income groups. However, using household data on non-durable consumption, we document that the relative prices of low-quality products that are consumed disproportionately by low-income consumers have been falling over this period. This fact implies that measured against the prices of products that poorer consumers actually buy, their "real" incomes have been rising steadily. As a consequence, we find that around half of the increase in conventional inequality measures during 1994"“2005 is the result of using the same price index for non-durable goods across different income groups. Moreover, given that the increase in price dispersion does not seem to be specific to our sample or time period, the overstatement in the increases in inequality from official measures can be even more significant, changing our view of how progress has been distributed in recent decades substantially." The price of a night at the Four Seasons has gone up more than the price of a shirt at Wal-Mart. Income inequality was the topic de jour during much of the election. The left argued that median wages had stagnated, and tried very hard to date this stagnation from 1980 so that it could be blamed on Ronald Reagan. Others have argued that the the whole median family wage stagnation thing was overblown, as 1) families had changed alot over 30 years; 2) Compensation had changed (such that wages were less of total compensation with the rise in value of health care plans); and 3) individuals matter, not quartiles, and individuals were doing well and still had mobility between income bands. My sense is that the income inequality numbers have always been fraught with problems. For example, rich people have huge incentives to manage the income numbers on their tax returns, so trying to draw conclusions about top earners from their tax returns is a bit dangerous. Just the shift from C to S corps and LLC's over the last 30 years has fundamentally shifted what income high net worth entrepreneurs show on their tax returns. All that being said, I think it is clear the income gap has grown, and it really started growing in this country around 1970. Whether this matters is a different story - its clear from comparing to European countries that while our gap has spread vs. their income gaps, its almost 100% because our rich are richer than their rich. Our lowest quintile is pretty comparable (here). If that is the case, its an interesting question to see if this bothers folks. Anyway, I think there still is work to be done to fully explain and rationalize these income inequality numbers. But I still find it hard to believe they are not somehow related to immigration. After all, dropping 20 million new immigrants, many of them quite poor, into the bottom quintile of US workers over the last 20 years certainly tends to pull down medians. Just compare these two charts, with income inequality on the top and the percentage of residents in any given year that are foreign-born (legal or illegal immigrants). I fitted the two charts together manually to get the time scales to line up, I don't have time to replot them together as I should. Click to enlarge. Its hard to see, by the way, how the top chart really reflects a trend starting with Reagan (as much as the left so desperately wants it to be true). Something happened around 1970 to reverse the curve. I have offered one possible cause. I do so reluctantly, because I don't want to be misunderstood -- I am a big supporter of open immigration and would hate to give the anti-immigration folks any ammunition. Anyway, you are welcome to discuss. It is something I am thinking about but don't have an answer for. Postscript: This is the chart comparing the top and bottom US deciles to countries in Europe on an absolute dollar basis. The conclusion I draw is that our poorest are in about the same shape as the poorest in Europe, but our rich are richer than in Europe. Given this, does our income inequality still worry you? 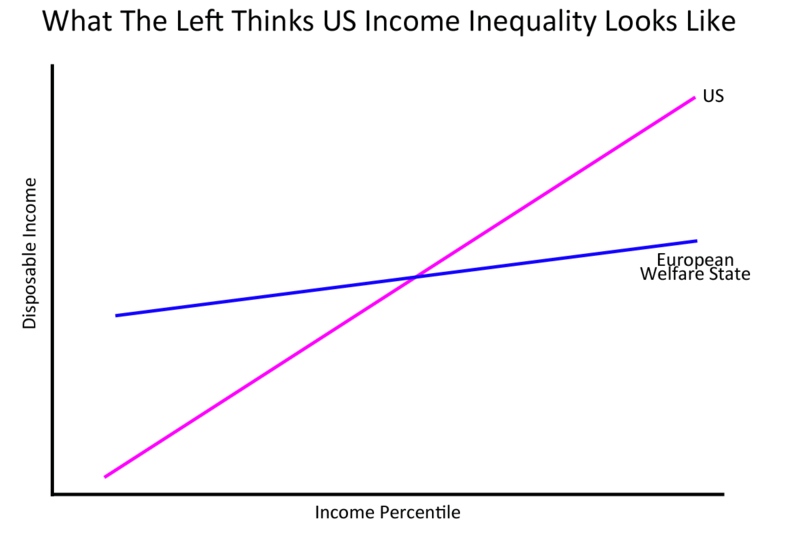 The reason the analysis is done this funny way is that what one usually sees is some country like Chad with the poor at 80% of the median income. But 80% of almost nothing is still almost nothing. So this chart converts everyone to apples and apples - almost. 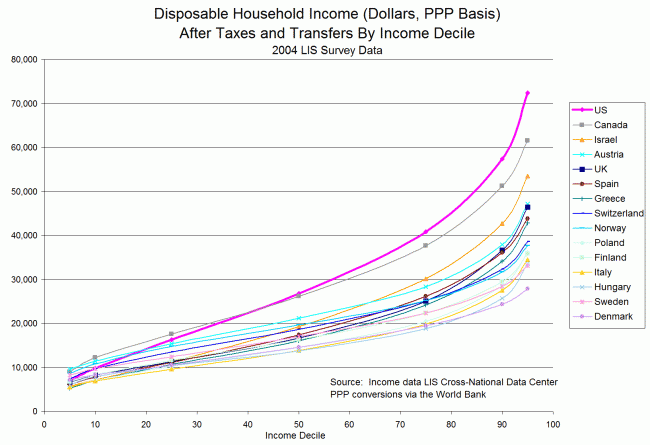 I still think it underestimates how well off the US poor are, maybe some sort of exchange rate vs. PPP problem. I am seeing an increasing number of articles of late about differential inflation rates, and how changes in income inequality may be overstated by using a single inflation rate for rich and poor. The argument goes that lower income folks who spend a relatively high share of income on goods that Wal-Mart and China have made cheap are experiencing a lower inflation rate than wealthier folks who have seen huge price increases at their favorite Four Seasons resort. Mark Perry has two interesting articles along these lines. ]Poverty comparisons across affluent nations typically use a "relative"
The average federal worker now makes over twice the wages and benefits of the average private worker. Maybe they have some sort of incentive plan, receiving a percentage of the value they have personally destroyed. Because sure as hell none of them are producing anything. If the Democrats want to fight income inequality and take on excessive compensation that is set without oversight, I might suggest beginning with the federal government. Postscript: TJIC has pointed out that he and I, though we tend to agree, often express ourselves differently. Here is my prediction of TJIC's response to this article: "We going to need a lot more rope." How's that, Travis? We have all heard that the US is backward vs. our much more enlightened bretheren in Europe on income inequality. The general argument is that US is somehow a worse place because out income inequality is higher than in most European countries. So, nations of Europe, how is that welfare state working out for you? Socialist paradise Norway is 20 times worse! How long will your poor be happy being told that, well, yes, the poor in the US are better off than you are, but you should feel better, because our rich in Europe are doing much worse than the rich in the US. PS- Stats from NationMaster.com, a database of country by country statistics of all sorts. Cool site, which also has a state by state counterpart. Update: Now that I have had time to poke around, I cannot find this data in the sources quoted, so it must be considered potentially suspect. The sources quoted actually try to make the point that US lags Europe in fighting poverty, so the conclusion of the chart above is not even consistent with the sources. (my guess is the data comes from the Luxemburg Income Study). However, it is interesting that this source material makes the same mistake I am trying to correct for here: That is, it defines poverty as a percentage of the median income in the particular country, rather than an absolute value, such that a country can have poor who are better off but still fail on the metric. You can see that here, where US has high poverty as on a "percent of median income" definition, but since we have the highest incomes in the world, it effectively gives the US the highest poverty bar to clear. Here is what I am looking for: Ideally, I would like to find a comparison of the median income say of the bottom quintile of each country, compared in absolute dollars on a PPP basis across countries. I would like to see the number both before and after government transfer payments. Europe, in their welfare economies, do better on poverty metrics when government transfer payments are included (and I am almost sure the chart above is before government transfer payments). However, I would argue that for the long term health of the economy, you would like to see how the poor are doing before these payments. Ultimately, and I will borrow a bit of environmentalist language here, this is going to be the most sustainable economy, where the poor gain wealth on their own, not from the welfare system. In fact, the welfare state, and this was my original point, actually suppresses self-earned income of much of the poor by eliminating the incentive to work. That is why I still think the chart at the top may be correct. Update #2: One other difference between the US and European nations is that we are much more open on immigration (yes, it may be illegal, but we pretty much still allow it). These immigrants, legal or not, are counted in our economic and poverty stats. If we assume there are about 15 million mostly poor illegal immigrants, plus millions of other quasi-legal immigrants, plus millions more who got amnesty in the 1980's, these immigrants add at least a fast five percentage points to any poverty metric the US is measured on. I have been surfing tonight, and it seems there are a ton of studies showing that US poverty is growing for some reason. Duh. Tens of millions of absolutely poor people, mainly from south of the border, have come to the US over the last several decades. It is no secret all these immigrants are poor -- that is why they are coming here, to find something better for themselves. Of course we have had a surge in poverty - we have been importing it like crazy! I happen to be pro-immigration, but I am fed up with these studies that try to pin the blame on growing poverty in the US on government transfer payment policy. It's the immigration, stupid! Several studies particularly lament the fact that childhood poverty is rising in the US. Can anyone think of a way this might be correlated to tens of millions of strongly Catholic Mexican immigrants, each and every one committed to large families?